Imagine your new home theater features a screen that serves as an extended loudspeaker, able to radiate sound linked to moving video images. Then picture your walls and ceiling lined with flat-panel loudspeakers that double as wall-art, light panels, or ceiling tiles. What if you were able to create this totally immersive sonic space for a modest price – say a couple of thousand dollars? “This is the new audio experience that we want to give people,” says Mark Bocko, professor and chair of electrical and computer engineering at the University of Rochester. Bocko is working on the project with his PhD student, Michael Heilemann, and former PhD student David Anderson, who has graduated and joined the electrical and computer engineering department. Their work could result not only in sonically immersive home theaters, but also make airport and subway public address systems easier to understand, and give signs a “voice” of their own. It’s an example of cutting edge audio technology being developed at Rochester that could also be commercialized here, helping establish the city as a key player in sound. 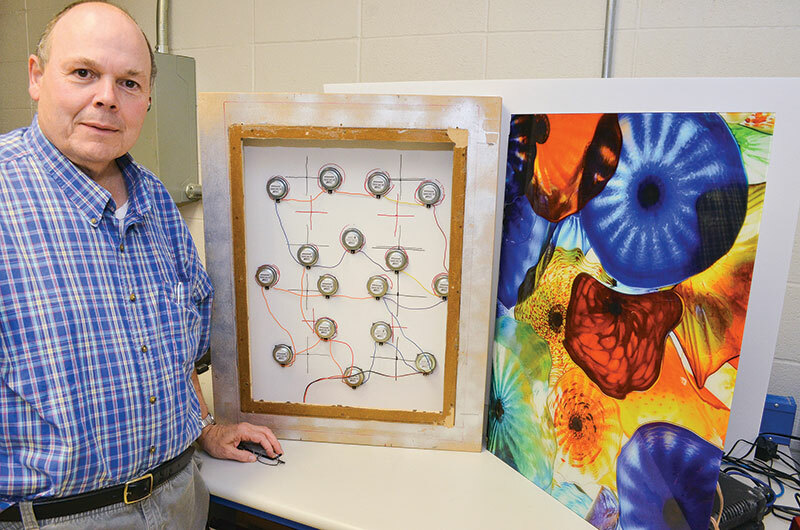 Bocko, who also directs the Center for Emerging and Innovative Sciences, is one of the organizers of Light and Sound Interactive, a conference and tradeshow to be held in Rochester September 12 to 14. It will showcase the city’s potential to take a leading role in other growing or emerging audio and visual technologies, including virtual and augmented reality, interactive games and media, and new displays and cinema. Flat panel loudspeakers now on the market are either “super expensive,” says Bocko, or suffer from acoustic shortcomings that require incorporating traditional cone loudspeakers that limit the shapes they come in. Companies have been trying for years to create less expensive, truly “flat” panel loudspeakers only an inch thick—typically by placing from one to a few small electromagnetic drivers on the back of panels made of glass, plastic, or other material. 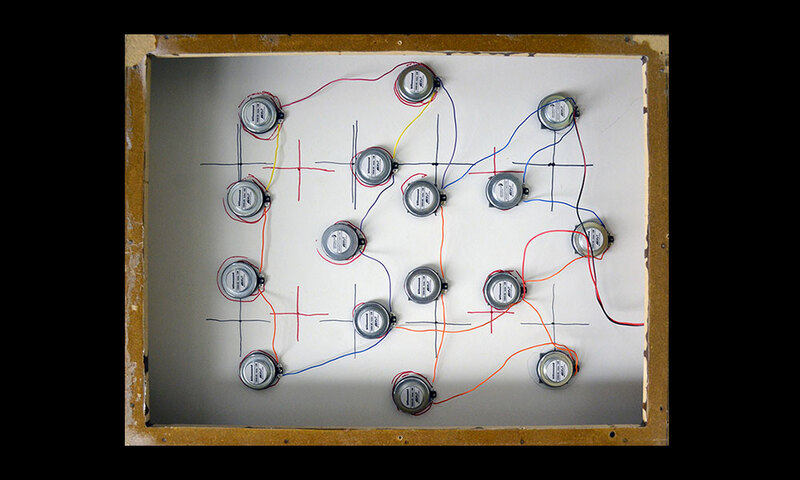 The magnets are each wrapped in electric coils and connected by wires to a circuit board, which is programmed to cause the magnets to vibrate. This in turn causes the panel to vibrate and produce sound waves. The key to their approach is the way in which the array of electromagnetic drivers is laid out, as well as the signal processing algorithms employed to closely control the vibrations of panels and the sound waves they create. Anderson and Heilemann have developed detailed models and created prototypes of flat-panel speakers that have audio fidelity that is “night and day better,” than previous flat panel speakers, Bocko says. The parts for a typical prototype cost about $20. Bocko, Anderson, and Heilemann—along with Mark Fiscella, a local engineer with extensive experience in product development and manufacturing—are in the process of forming a company to commercialize the technology. They have other potential applications on their radar as well. Flat-panel loudspeakers could do double duty as signs for advertising and tradeshows, and for other commercial applications, such as fast-food drive-thru menus. Overhead LED lighting panels can also be turned into loudspeakers, Bocko says. Spaced throughout airports and subways, they wouldn’t need to be turned up as loudly as the more widely spaced PA loudspeakers now used. This would cut down on the echoes and reverberations that make airport and subway messages almost impossible to discern at any distance. “But the application I get most excited about is home entertainment systems,” Bocko says.